The tour ended in the Champagne Region, where we visited 3 Champagne Houses. (1) The family run, small Grower Champagne House Jean Josselin, (2) the medium-size family owned and run Champagne House AR Lenoble in Epernay and (3) the large Champagne House Taittinger in Reims. At AR Lenoble, Christian Holthausen, Export and Communication Manager, was our host. He came all the way from Paris to receive us. He introduced us quickly to the production facilities of AR Lenoble and led a fantastic AR Lenoble Champagne. We have met Christian many times before, including at several European Wine Bloggers Conferences. AR Lenoble is one of the rare producers in Champagne that has been consistently family­-owned and entirely independent since the very beginning. AR Lenoble was founded in 1920 by Armand ­Raphaël Graser who arrived in Champagne from his native Alsace in 1915 in the middle of the First World War. Not wanting to have a German­-sounding last name at that particular moment in history, he christened his wines “Lenoble” as he believed the wines of Champagne to be the most noble wines in France; his initials “AR” preceded the “Lenoble” and a new bran was created. Today his grandchildren brother and sister Antoine and Anne Malassagne are owners and manger of the estate. They took over in 1993 from their father and in just over twenty years, they have quietly yet confidently transformed AR Lenoble into one of the jewels of the Champagne region. CHOUILLY, the northernmost Grand Cru village located on the celebrated Côte des Blancs (10 hectares are estate-owned by AR Lenoble) and home of some of the most magnificent Chardonnay in all of Champagne. BISSEUIL, the Premier Cru village located between Mareuil-sur-Ay and Tours-sur-Marne (6 hectares are estate-owned by AR Lenoble) and home of rich and structured Pinot Noir. DAMERY, the site of AR Lenoble since 1920, located to the immediate east of Cumières. The village is home to some elegant and expressive Pinot Meunier due to soils that are a combination of clay and limestone. AR Lenoble is fortunate enough to own 2.5 hectares. Christian Holthausen: Ploughing is routinely practiced in our vineyards to make sure that our plants are able to obtain the maximum of nutrition from the soils. We let the grass grow in our vineyards in order to reduce yields on purpose. Our yields are significantly lower than the average yields in Champagne, year after year. We control the date we begin picking in each of our parcels to consistently obtain ideal ripeness. AR Lenoble was the second House in Champagne to be awarded the “Haute Valeur Environnementale” certification in recognition of more than 20 years of environmentally-friendly procedures put in place on the estate: zero use of chemical fertilisers, practically zero use of weed killer, drastic limits on the use of phytosanitary inputs to control mildew and powdery mildew in the vineyar, and particular attention to biodiversity and enhancement of the vineyard with hedgerows, orchards, embankments, trees and low walls. A parcellaire approach which begins in the vineyard is followed by a vinification adapted to the harvest and to the parcel, meaning that our wines are ‘made to measure’ in every sense of the word. A combination of different vinification vessels are employed so that individual parcels are fermented accordingly in small Burgundy barrels of 225 litres, 5000-litre foudres, stainless steel tanks and/or enamel-lined tanks. All reserve wines are conserved in either small Burgundy barrels of 225 litres or 5000-litre foudres. Malolactic fermentation is done or not done according to parcel and year however it is never done for vinified or aged under wood. Evaluation of the different vinified parcels begins in December and lasts for a period of six months. Once the blends and wines are decided, bottling takes place. Bottles are aged underneath the winery in the historic 18th century cellars. A constant temperature of 11°C and a humidity level of 85% ensure that the wines are aged in only the most pristine conditions. Long periods of ageing is mandated for all wines, never less than three years. AR Lenoble was an early advocate of limiting dosage in order to let the terroir express itself purely and precisely. 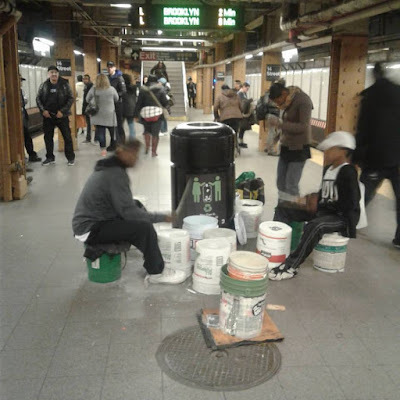 We don’t believe in low dosage as a “marketing trick”. For each wine it is a question of finding the right balance. We have taken a lot of time to determine the right dosage and have decided for most of our wines, dosage is never more than a maximum of 6g/l. AR Lenoble Brut Nature Dosage Zéro was first released more than 15 years ago and is considered to be one of the first world-class examples of this style of wine. Total production is some 320.000 bottles per year, of which 50% is exported, and which are not released before at least three years of ageing in the cellars followed by three additional months of post-disgorgement ageing. For comparison, Roederer‘s output is 5.000.000 bottles. Thanks Christian for a most enjoyable tour and tasting. Rieslingfeier is an annual event in New York City that celebrates Riesling, in particular German Riesling. The cornerstone event is the Rieslingfeier Gala Dinner. Inspired by Daniel Johnnes’ famous Burgundy fête “La Paulée” it is very likely the greatest German wine BYOB dinner in the world, with both winemakers and guests bringing special bottles from their cellars to share. Rieslingfeier is orchestrated by Stephen Bitterolf of the vom Boden wine importing company. 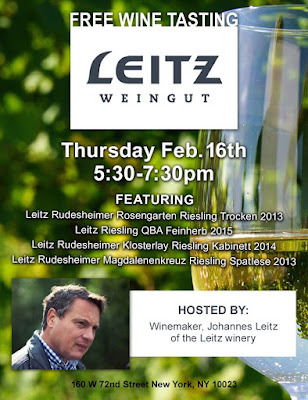 This year, Rieslingfeier took place on Friday, February 17 and Saturday February 18. 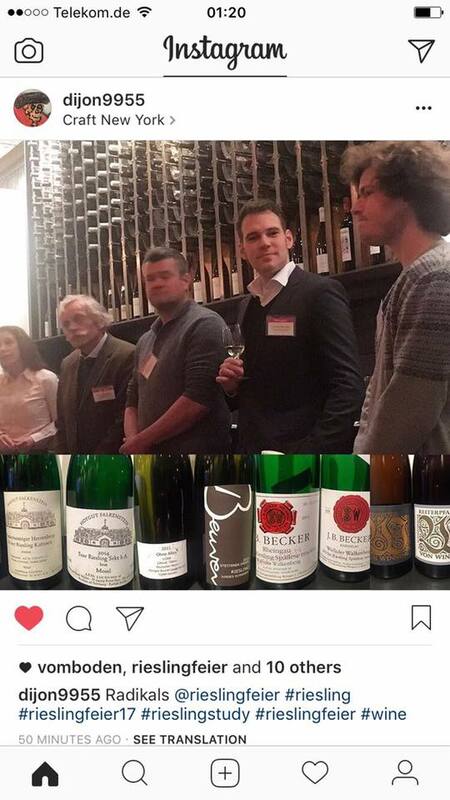 13 top German wine producers and (for the first time) 2 top Austrian winemakers were in attendance. Almost all of the photos are mine. I used a few photos from other participants, which they put on facebook. Annette Schiller, who organizes wines tours (ombiasyPR and WineTours), and Christian Schiller, who blogs on schiller-wine, joined the 2017 celebration of German Riesling. 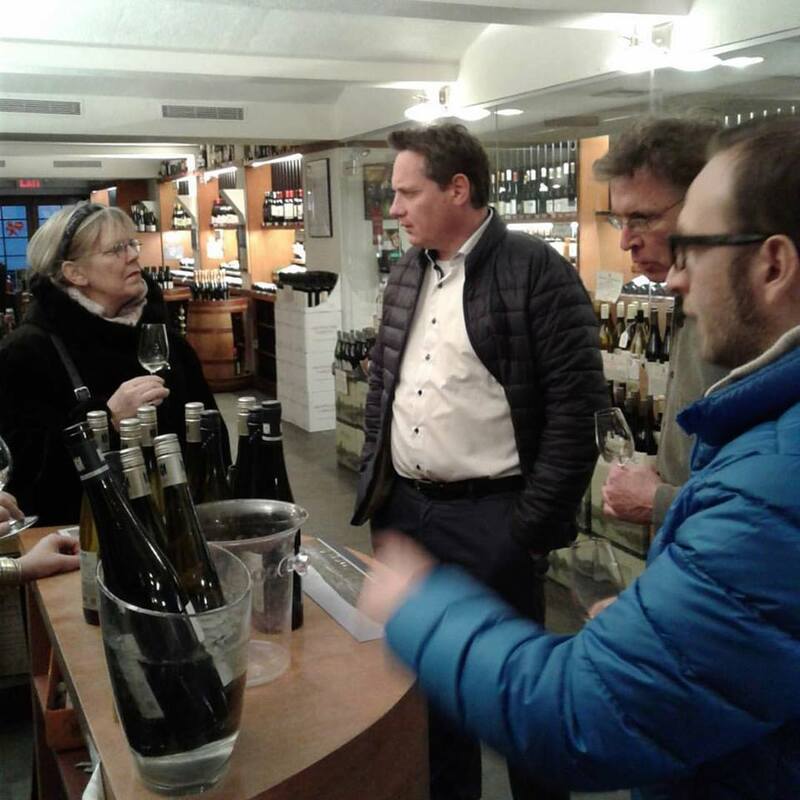 We were happy to meet the participating German elite winemakers. Many of them we know personally. Some of them we call our friends. There were 2 kinds of events. First, there was the official Rieslingfeier program: The official program comprised 3 major blocks: (1) A series of 4 seminars on Friday; (2) the Grändtasting on Saturday during the day and the (3) Rieslingfeier Gala Dinner on Saturday evening. Second, there were Rieslingfeier side events, including winemaker dinners and tastings. A very special side event was a BYOB dinner on Friday evening at a Chinese restaurant in Chinatown, with many Rieslingfeier winemakers participating, organized by a Riesling fanatic based in New York. Finally, Annette and I did a few things unrelated to the Rieslingfeier, which I am also ncluding in the Rieslingfeier Side Events part of this posting. 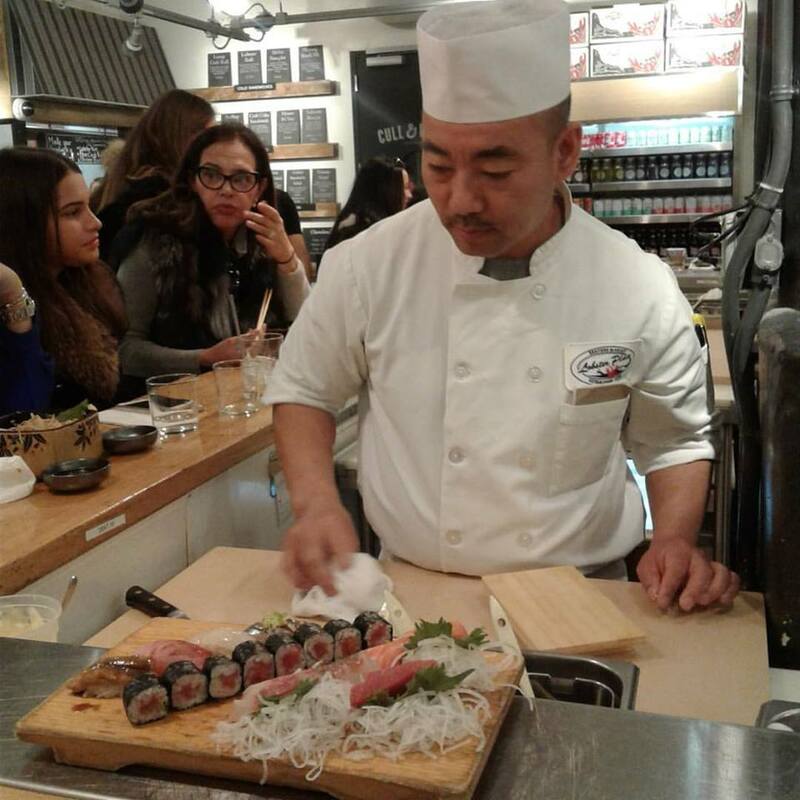 The kick-off was Friday, February 17 at Cork Restaurant with of a series of 4 seminars. 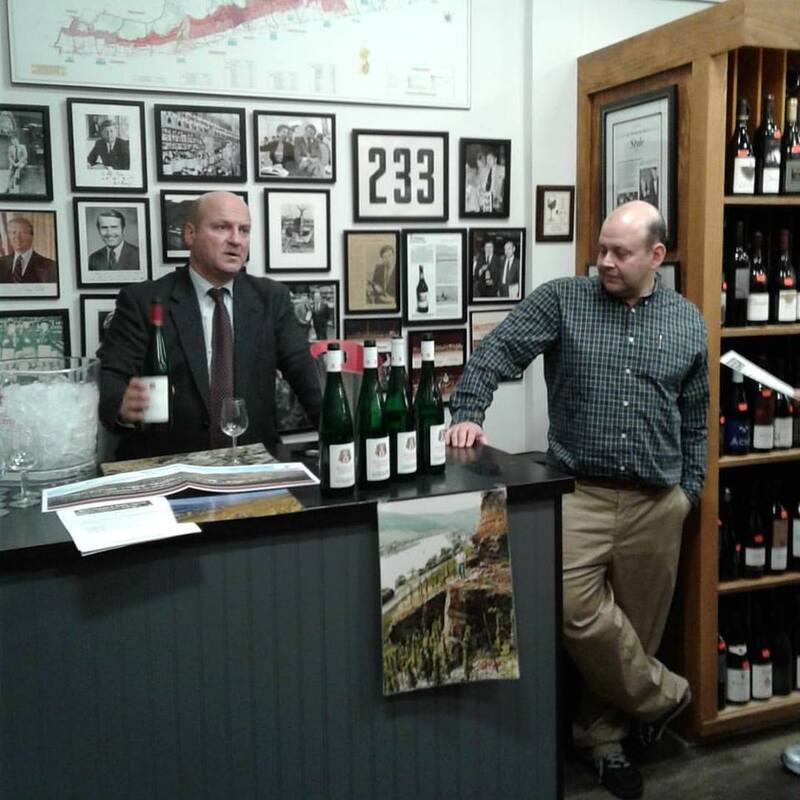 “Speaking German” was an industry-only tasting/discussion focusing on the challenges, and rewards, of German wines, with a focus on restaurant and retail practices. The 3 producers each poured a GG and a Kabinett wine. This was a free, industry-only seminar. All the Rieslingfeier growers were be in attendance for this walk-around tasting. 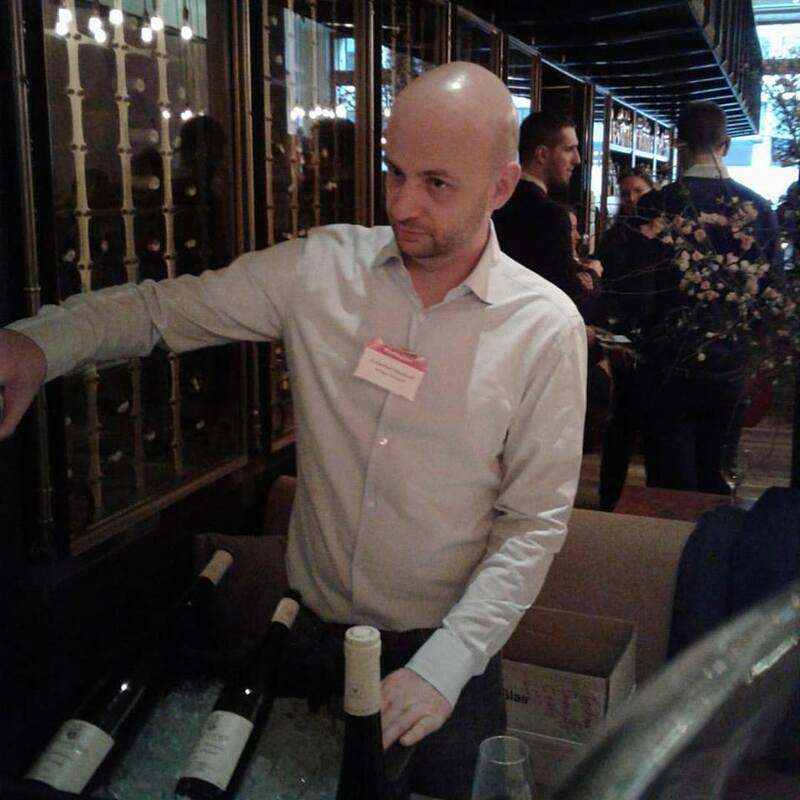 The event largely focused on wines from the 2015 vintage. 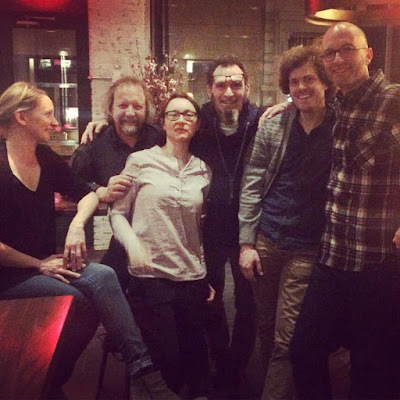 The arguably most spectacular Riesling Party of North America took place at the trendy Reynard in the Wythe Hotel in Brooklyn, on Saturday, February 18. 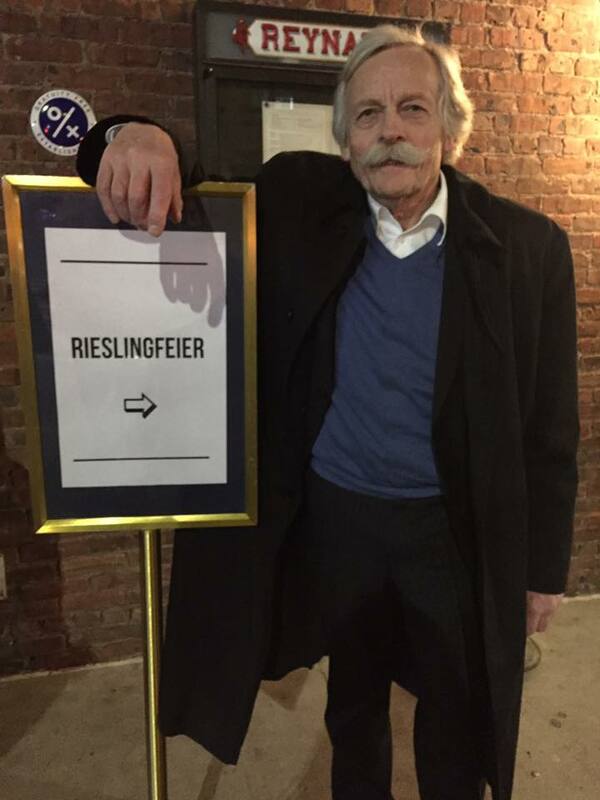 About 130 wine freaks made the pilgrimage from across the country to NYC to be with 13 top German producers and 2 Austrian producers, leading wine and food journalists, importers, and sommeliers to enjoy a casual dinner and Riesling rarities. There were 14 tables with 1 winemaker and 10 guests at each table. 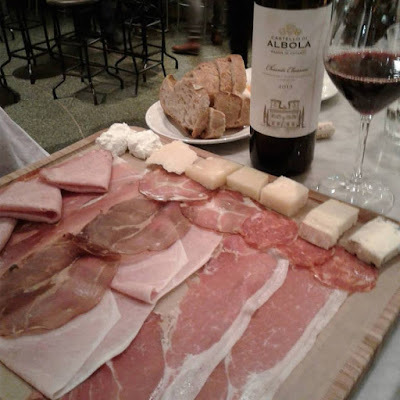 There was one table with 2 winemakers at the same table. The five course meal was customized by Reynard’s Chef Sean Rembold to pair with dry and off-dry Riesling. The wine service was presided over by Rieslingfeier Chef Sommelier Raj Vaidya along with a group of the country's top sommeliers. My wife Annette Schiller and I were sitting with Clemens Busch, Weingut Clemens Busch from the Mosel. At each table, about 20 wines were served. At my table, were pouring the wines. All the wines were outstanding, but some of them were out of this world. You could walk to other tables and taste the wines poured there. Guests and winemakers also walked around and shared the wines with other people. The evening began at 7pm with a Weingut Dreissigacker Sekt reception. Dinner started at 8:00pm sharp and ended at around midnight. Some of us went to the rooftop bar of the Wythe Hotel to end the evening with a gorgious view of Manhattan. Attending German star winemaker Johannes Leitz called it a „slaughterhouse event“. 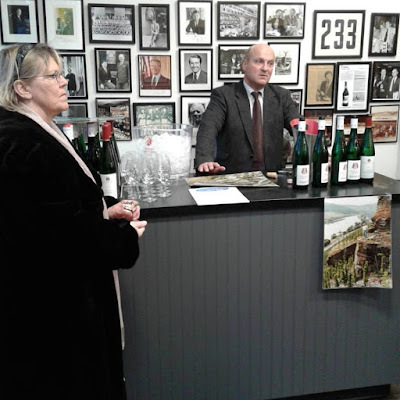 The evening began at 7pm with a Weingut Dreissigacker Sekt reception. There were 14 tables with one winemaker and 10 guests or so sitting at one table. (There was one table with 2 winemakers). For us, the Rieslingfeier started on Wednesday evening (February 15) in Washington DC at MacArthur Beverages. Phil Bernstein of MacArthur Beverages had convinced Johannes Selbach to travel from Germany to New York via Washington DC and to show his new vintage to Phil‘s customers in Washington DC. Annette and I travelled to New York via bus on Thursday. We had made reservations at the Metropolitan Opera. Before the opera, we joined Johannes Leitz at a tasting close by the opera. 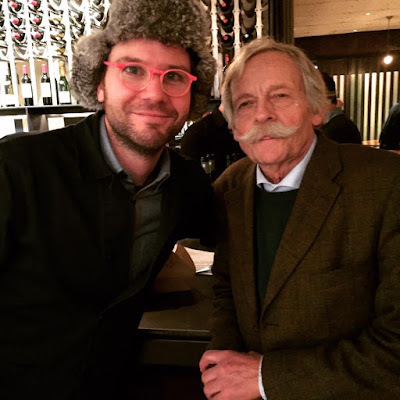 Following the opera, we were torn between joining Clemens Busch at Rouge Tomate where Star Sommelier Pascaline Lepeletier had organized a winemaker dinner with Weingut Clemens Busch and Weingut Falkenhof that evening. We left the Met at 11:00 pm and felt that it was too late for Rouge Tomate, which usually closes at midnight. However, we were wrong. Somm Pascale Lepeltithe er told us the next day that guest and winemakers stayed until 2:00 pm. Instead, we went to Williamsburg to Maison Premier, a well known for oysters and cocktails and open until 2:00 pm during the week and 4:00 pm during the weekend, for our project: On the Heels of Stuart Pigott. Leading German wine journalist Stuart Pigott used to live in Williamsburg for a few years. 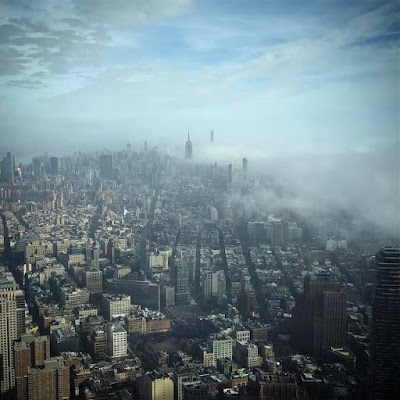 He just published an article in Der Feinschmecker, a leading German Gourmet Journal, in which he describes afew of his favorite New York spots, including Maison Premier, which is just around the corner from where Stuart used to live. Annette and I attended the first seminar only. We then went to the The Lobster Place in the Chelsea Market for a light lunch. At 4:00 we met for Happy Hour drinks at Paul Greco‘s Terroir with German Wine Importer Justin Christoph an his wife. A very special side event was a BYOB dinner on Friday evening at a Chinese restaurant in Chinatown, with many Rieslingfeier winemakers participating, organized by a Riesling fanatic based in New York. Between the Gränd Tasting (see above) during the day and the Rieslingfeier Gala Dinner in the evening (see above), we had a couple of hours to kill. We went to The Four Horsemen in Williamsburg, also a recommendation of Stuart Pigott. The Four Horsemen focusses on natural wines. Before hopping on the Vamoose bus to go back to Washington DC, we met with German Wine Society (Washington DC Chapter) Board Member Al Friedman for lunch at Eatelly (Flatiron). Rieslingfeier was founded in 2012 by Stephen Bitterolf, a passionate advocate for Germany's culture of winemaking. He was the Wine Director at Crush Wine & Spirits in New York where he helped develop one of the largest German wine programs in the country before founding his own import company, vom Boden.